This was indeed tasty, fast and easy. I marinated bone in legs, thighs, wings and backs for about an hour before baking. I baked them on a sheet pan per Hillsboroks's comment, but still had difficulty getting the marinade to evaporate to get a good glaze on the chicken. I upped the temperature toward the end of the cooking and that helped quite a bit. My new favorite marinade for chicken. Really nice flavor and since the chicken just bakes in the oven after marinating, it is very simple to prepare. Only needed 30 minutes to cook because I used boneless thighs. Only other substitution was 1/4 tsp dried thyme since I didn't have any fresh. Served with roasted potatoes/sweet potatoes and a salad or vegetable. Fabulous flavor and nice change of pace for chicken. Like Christine I too used boneless, skinless thighs. I was cooking for a group of 9 so I doubled the marinade recipe and left the chicken thighs in the marinade for about 1 1/2 hours but next time I might leave it in for 2 or 2 1/2 hours to see if the flavor is more developed. Very simple to make ahead for a dinner party. Just take the chicken out of the marinade and bake for 1/2 hour before the guests arrive. I did 20 thighs in two large pans and only had two left over. I received lots of compliments and requests for the recipe. I baked them in Corning Ware low roaster pans but next time I might try them on metal sheet pans because the marinade and chicken juices didn't evaporate as much as I thought they would and I would like more of a glaze on the chicken. This was very easy and it was a good dish. The chicken has a sweet, sticky, soy and lime glaze. I think it would be nice with some ginger added. While I liked this, it probably will not be a repeat for me as there are other easy chicken recipes with Asian flavors that I prefer. This is a variation of the Pacific Lime Chicken recipe. Also easy to prepare and tasty, but I do prefer the original. About as good as expected on reading the recipe. Needs a much bigger pan, flavors a bit muddy. Tasty. I did add more feta than the recipe called for because I was trying to use up some I had. The liquid at the bottom of the baking dish was onion soup like - yummy spooned over the chicken. Next time I would probably cut up the chicken, the chicken breasts I had were a little too large to be one serving. I cut them in 1/2 after taking it out of the oven. But would be easier to just cut them up before hand. This was a marvelous easy dish to throw together after a day of working in the yard. I made only one half the recipe for two people and we still have leftovers for tomorrow. Next time I would double the amount of garlic. The garlic was so good with the chicken and potatoes! I used an assortment of small rose-fleshed, purple and yellow potatoes from the farmers market that were perfect in this dish. Paired with a local wine, Abiqua Wind 2014 Pinot Gris, and some lightly steamed fresh asparagus, this was an incredible spring dinner. We will be making this many times in the future. I made this on a sheet pan and cut the potatoes slightly smaller than specified in recipe after reading that a couple of reviewers found potatoes undercooked. I did not have fresh rosemary so I substituted thyme. This was very simple and flavorful. This was a good, easy everynight dinner. I was making it at my parents' house and they didn't have balsamic vinegar (or any red wine vinegar) so it lacked a bit for that - I found it too oily without the vinegar balancing. But it tasted good and the roasted garlic and rosemary added good flavours. I made this on a single sheet pan with legs and thighs. I cut the potatoes quite small and spread everything in a single layer to ensure they would cook through in the time allotted. This was a great dish with lots of flavor! Great tip to rub the chicken skin with salt before roasting to crisp the skin. This is a great roast to make last minute with ingredients I often have on hand. Red onions, rosemary, potatoes, and chicken, that's it. Good dish to bring to a sick friend for quick reheating. But don't rub chicken with Kosher salt; make sure to use fine sea salt, as noted in recipe. That's a oversalted mistake I only made once! This has become a family standby. Somewhat exotic, loads of flavor, easy to put together. Fantastic dish -- really flavorful. Next time add more onions - they were sooo good. This is a real explosion of flavor. The marinade with preserved lemon flesh, garlic, and smoked paprika really makes the dish. Don't add extra salt - the preserved lemons and olives are enough. This is basically a sheetpan supper with nice flavor from the smoked paprika and lemon. Yum. Very nice flavor and very easy to throw together. I did add extra salt because I omitted the olives. I went a little light on the preserved lemon, which was a mistake--the savory chicken and sweetness of the sweet potatoes can really stand up to a lot of it. Chicken pieces are marinated in olive oil and an ample amount of fresh thyme. When it's time to cook you season with s&p, grill, and serve with lots of lemon juice. I departed from the recipe by using bone in thighs (she calls for boneless but skin on, which is not an option readily available to me) and cooking on a charcoal grill. These thighs were salty, herby, smoky, juicy, and happily devoured by all. A winner! Needs *lots* more hot sauce, but this is a winner. I use boneless skinless chicken thighs instead of poussins, roast at 400 for about 35 minutes. This is so easy and so tasty. The herbs and lemon slices add a lovely freshness with the spices. I usually serve this with roasted butternut squash (sometimes with a bit of coriander tossed with it before roasting) and couscous with currants. A special seeming meal that takes almost no time to make. I used boneless skinless chicken thighs and roasted at 400 for 35 minutes. Easy and full of delicious flavor! I served it in pita with yogurt, feta, lettuce, and radish. This was incredibly easy and amazingly flavorful! I dialed back the cayenne in the marinade to 1/4 for my heat-adverse husband but he said it could be hotter so next time I will only cut the cayenne in half. Great weeknight dinner choice. Made a half recipe and thought the lamb could have used a bit more kapow. However the tzatziki was good, and the flavors were good together, and it was an exceedingly fast and easy dish, so I may try again. Next time I think I will generously salt the marinade, and perhaps leave the honey out so that the pom molasses flavor comes to the fore. Also perhaps more garlic. Great weeknight dish that takes little effort. This recipe sounds a bit boring, but it was very good in a comfort home cooking sort of way. The mustard, onion, breadcrumbs were delicious with the pork. This is a keeper. A solid B+. Everyone ate it, but nobody seemed to love it either. I thought the dipping sauce was a bit pungent/salty, but folks seemed to like it. I had to omit the cilantro stems from the marinade and that might have affected the outcome. For the chops, I used a large boneless sirloin chop, sliced it in half, then quickly cooked it, a few minutes per side. I thought it came out well done this way and would do this again but with the seasoning for the italian pork chops. Very easy prep. The pork was a little dry, I thought, but plums nice foil for spices. This is not one I would rave about, it's just ok. This is one of my favorite pork chop recipes. The 5 spice flavor predominated but that's ok with me. I agree with TrishaCP that you need firm fruit. I am looking forward to serving this next time with the http://www.eatyourbooks.com/library/recipes/1021766/chinese-style-plum-sauce from Salt Sugar Smoke. Quick, tasty dish for a weeknight dinner. We tried this last night and really liked them. Not too much prep and most of the time they cook unattended in the oven. The flavors of the sweet plums pair nicely with the pork, spices and other ingredients. This took all of 5 minutes to prep and then I let it marinate for about an hour. This was surprisingly good for such a simple recipe. It had all the flavors of hot Italian sausage. I think the cooking time that Ms. Henry suggests is a bit long. The recipe calls for 8 oz pork chops and 20 minutes in the oven at 425 F. My pork chops were quite thick and about 12 oz and when I checked them at 20 minutes, they were a bit overcooked. Juicy and delicious. The fennel seed was strong and a wonderful flavor. Very little effort for the outcome. Will definitely make this again. We liked these. I subbed fresh oregano for dried, and pulled the chops at 145 degrees. Delicious! Served with lamb chops. Going to try on creamy scrambled eggs next. The acidity of the sauce really brightens up fatty things. This was indeed simple, and also extremely flavorful, though it takes at least two hours to cook (actually could have used more time - some of the carrots were still crunchy). I used home-cooked beans, panko, a bit of red wine (less than called for) and sweet italian sausages. I think it would have been even better with better breadcrumbs. E ate everything, O only ate the sausage. I love the flavors in this dish. Wonderful comforting meal for a cold winter day. So delicious and very quick and easy to put together. I was a bit skeptical having made a chicken and apple dish in the past that was a total disaster, but this was really wonderful. It was one of very few recipes in my collection I thought would work with the package of Indian-spiced sausages we had in our freezer. The flavoring of the sausages was much more subtle than I thought it would be though, so I don't think that makes or breaks this recipe. I wasn't sure if I should use the whole leeks or just the white/light green parts, so I decided to just leave out most of the dark green parts and save them for another use. Once I saw how the leeks cooked down though, I know that using the whole leeks would have been just fine -- however my 13x9 baking dish really wouldn't have fit the 3 full leeks anyway. Next time, I think I would use 2 entire large leeks and call it a day. I used honeycrisp apples and they definitely do not need to be peeled. A really fantastic, simple dinner. Simple to put together, and a nice homey meal on a cool evening. Great with mashers. This was exceedingly easy but did not rise to be more than the sum of its parts, as I hoped it would. My family liked it more than I did. I made this with a few changes- I had a boneless butterflied leg of lamb so I stuffed it with some of the spinach/feta mixture and placed the rice and spinach around it. I used Korean chives instead of scallions, to use them up. Instead of lemon juice to finish I chopped a preserved lemon and added it to the rice for the last few minutes. Even with extra broth and oven time, some of the rice was chewy but over all this was a keeper. I had a whole fish from the CSF and all ingredients on hand for the sauce, so followed this recipe. My fish was a bit larger so the cooking time was a little longer. The fish roasted up very nicely. The sauce came together easily but was a bit milder and also a bit runnier than I had anticipated. It was pretty good but not knock your socks off. I made a half recipe of the sauce and had quite a bit leftover, which I used as a marinade for chicken drumsticks. That was pretty good too though again a little blander than I would ideally like. I would like to try some of the other sauce/relish options on this page. We enjoyed this both in color and flavor, and prep was exceedingly easy. However ... my breadcrumbs were not crispy! They had been in the freezer for a while, perhaps try again with panko? This has become a staple recipe. Quick and easy, and the breadcrumb topping is both very savory from the cheese and garlic, and brightly flavored from the parsley and lemon zest. The topping is also terrific sprinkled over asparagus before roasting. I reduce the oil by half, and it's plenty. Love this and now make it regularly. Watch the lemon. I put too much on the first time and everybody complained. I now hold back a bit with the lemon and add some salt to the crumb mixture and it's perfect. Made with acadian redfish from my csf. For one pound of fish, used 6 oz bacon, no olive oil and cut back the butter a bit. I cooked the fish entirely in the oven. My family liked this dish, ate it up pretty eagerly because of the bacon. This is the best treatment for this fish that I've tried so far. This is one of the best fish dishes I have ever made- or eaten. It is sublime. The flavors work together perfectly and the result is very elegant and delicious. This was nice and easy, and the orange flavor does not overwhelm. I would do it again. I used ocean perch fillets. Quick and easy, but not terribly exciting. This is very spicy and good. I added some anchovies to the garlic and pepper flakes as they cooked. Very satisfying meal for a very cold day. Watch the onions towards the end (a few of mine burned). Onions smell incredible while roasting. If this sounds good to you, trust your instincts. I love it. Add this to your repertoire for quick meals to make from pantry items! It is fantastic. I've made lots of walnut sauces but this is the very best I've tried. The effort to result ratio is outstanding. I toasted the walnuts for an extra layer of flavor and used regular dried noodles but otherwise stuck to the recipe. When I can't find (or be bothered to find) squid, I use shrimp. This is a big tasting, delicious plate of pasta. My husband requested that I "never make this again." I'm a bit surprised, as the flavor combination sounded good. Maybe it was the squash, which wasn't skinned? I made this salad with leftover rotisserie chicken, and I also subbed pistachios for pinenuts since that is what I had on hand. Everybody in the family enjoyed it. Really liked this simple potato salad. The shallots were surprisingly delicious. This is a very delicious dish, that I didn't want to stop eating. The sweet-spicy seasoning of the vegetables is well complemented by the yogurt-tahini sauce. I didn't use the exact vegetables listed, but no matter, this is completely adaptable to what's on hand. Note that the yield on the sauce is very large; I cut the quantities in half and had plenty. I served this with couscous dressed with preserved lemons, parsley and feta. Very nice dinner. This is a lovely change of pace when zucchini season hits it peak and you can't bear your same old zucchini recipes one more night. It came together very quickly and the flavors were lovely. The finished dish looked just like the photo in the cookbook and we really enjoyed it. I couldn't find ricotta salata so I used regular ricotta instead but it worked just fine. I really liked the addition of maple syrup and dijon but next time I would cut back on the olive oil. It was way too much. This prep was more fiddly than my usual method of slicing the squash and roasting with nothing more than salt, pepper and liberal amounts of olive oil. I'm not sure if the thyme, garlic and butter added so much more to the basic version that I would bother to take these extra steps very often. I did, though, like the savory flavor that the melted butter added to the squash and I really found myself enjoying the leftovers. Very easy and very refreshing; I'll definitely make it again. I made this cake with fresh rhubarb and enjoyed it. The cake had a lovely taste and texture. It took close to 50 minutes before it was done (not the mere 40 suggested in the recipe). Made with 700g peeled, diced apples (and no extra sugar). Absolutely delicious! It did take almost an hour to bake in my slow oven. This recipe would work with any fruit. Made again w 1 stick butter, 4 oz white whole wheat flour (use KA flour recipe for self-rising flour substitute), 4 oz sugar, 700 g apples (or a little less). Really good and the white whole wheat flour was just fine in this recipe. Make sure to press the apples down into the batter and cut thinner pieces next time as some of them stayed a bit too firm. Really yummy cake, my family loved it. I used this syrup for drinks, rather than over ice cream, and it is delicious and wonderfully refreshing in a glass of sparkling water, with or without gin. In future, I would allow the lime zest to steep in the syrup as it cools, then strain it out because the finely grated zest just fell to the bottom of the bottle/glass. An everyday cookbook that expertly blends ease and style from one of the UK's leading food writers. 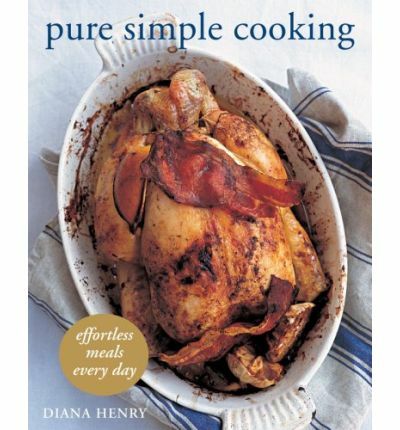 In 2007, Diana Henry was named Cookery Writer of the Year in England by the Guild of Food Writers. Whether deciding how to dress up a tub of ice cream or determining what fish to choose for a simple weeknight dinner, Diana Henry shows how to make each dish memorable. Her classic recipes focus on enhancing simple food with fresh ingredients and pantry staples, like Pear, Fig, and Prosciutto Salad with Pomegranates and Lamb Chops with Pea and Mint Puree. With an appealing mix of recipes from Provence, Italy, North Africa, Greece, and other regions, Henry celebrates the domestic while recognizing the need for streamlined, foolproof cooking techniques. She embraces the truth that good food is often best cooked simply.